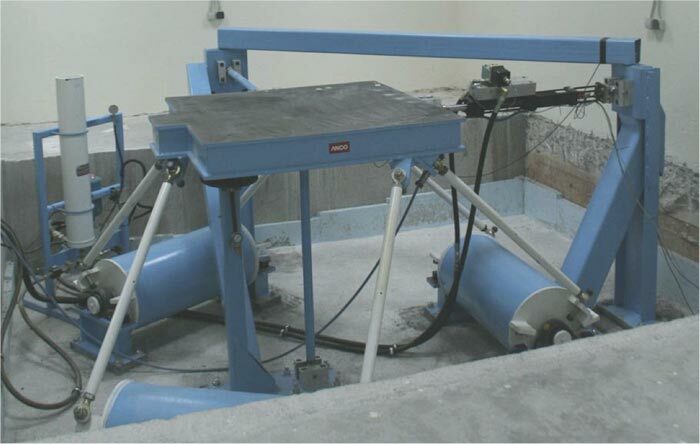 The Laboratory is equipped with a state-of-the-art shaking table (designed and constructed by ANCO Engineers), which is capable of shaking soil-structure specimens of up to 2 tons at accelerations of up to 1.6 g on its 1.3 m x 1.3 m table. The shaking table can reproduce any ground motion, from synthetic motions to real earthquake records. The hydraulic actuator is capable of producing a stroke of +/- 75 mm. The seismic motion can be applied to all three directions (x , y, and z). The actuators have a servo-valve controlled by an analog inner-loop control system (displacement based), and a digital outer-loop control system (acceleration feedback based). Degrees of Freedom : Three degrees of freedom ( X , Y , Z ). R 51: x – direction; R 52: x and y directions ; R 53 : all 3 directions. Local 10-gallon accumulators at manifold for line pulsation control and maximum high velocity performance. It also includes 8 channels ADC with AA filters and 3 channels with Piezoelectric feedback accelerometers.